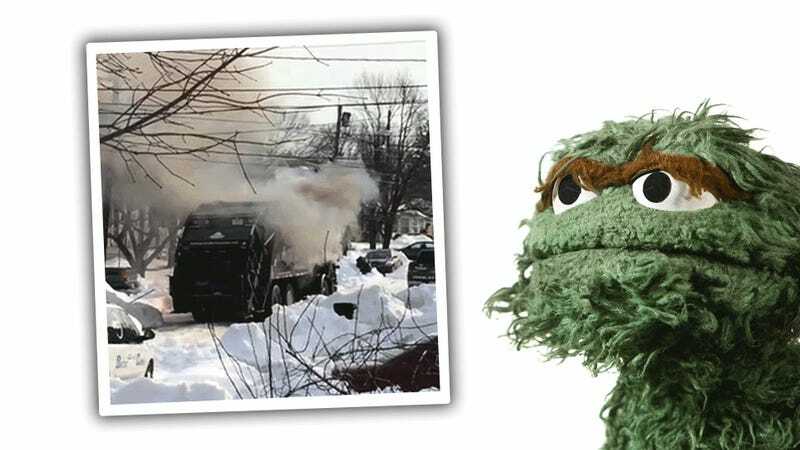 Watching this garbage truck explode in a New Jersey neighborhood, it’s hard not to be reminded of a cheesy action movie. Well, a cheesy action movie shot vertically, in order to incite comment-section riots. It’s no movie, though, it’s what happens when a compressed natural gas tank explodes. Investigators in Hamilton, NJ have determined that a faulty battery compartment started the electrical fire that caused a CNG garbage truck to explode last week, according to Police Capitan James Stevens. The fire spread from the battery to one of the CNG fuel tanks, causing the tank’s pressure relief device to activate and vent fuel into the air, as reported in Next-Gen Transportation News. The garbage truck operators tried to extinguish the flames, and failed to do so before calling 911. Luckily, nobody was hurt, though at least three houses suffered significant damage from flying debris and the CNG tank that “exploded was like a missile,” according to Hamilton, NJ police chief James Stevens. Natural gas is being used on many fleet vehicles like garbage trucks, and has been used for years, being a relatively cheap, plentiful, domestically-produced fuel. Unlike regular gas or diesel tanks, CNG tanks are at high pressures, and in the case of accidents or fire, can rupture, explode, shoot off like a missle, and all kinds of exciting things. It’s rare, but not impossible, as we see here.